A berry twist on the classic chocolate Swiss roll cake recipe! 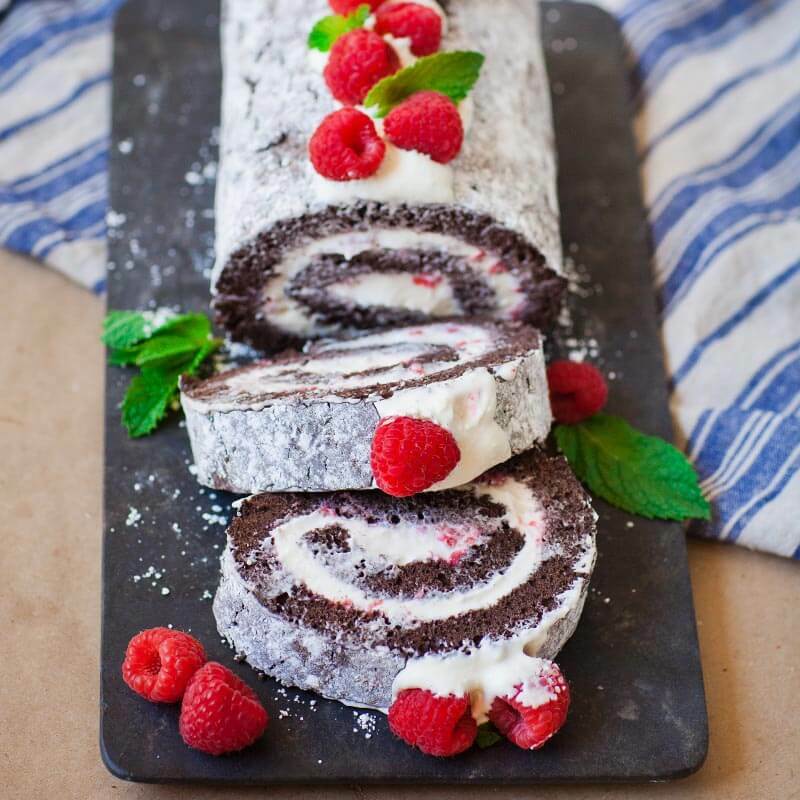 This raspberry chocolate Swiss roll is made with fluffy chocolate sponge cake, filled with loads of fresh raspberries, raspberry liqueur, and a fluffy whipped cream frosting! The flavors are simply divine and will have you coming back for seconds. And my favorite part – the cake has the perfect amount of sweetness and fruitiness! It’s not too sweet and will satisfy your sweet tooth! Watch my video recipe for all the sweet details and step-by-step instructions! Want to receive new recipe updates? Make sure to subscribe to my YouTube channel! This elegant and simple cake starts with the most basic cake recipes – chocolate sponge cake! I have a separate video recipe for the chocolate sponge cake if you want more in-depth instructions. This chocolate cake recipe is great because it’s malleable so it won’t break when filled and rolled. It’s also on the drier side, which works for the recipe in this case. The dry cake is perfect for soaking with raspberry liqueur and will hold the whipped cream filling very well. Important note: make sure to roll the chocolate cake as soon as you remove it from the oven! Just dust the top of the cake with confectioner’s sugar to prevent it from sticking to your kitchen towel. Roll the cake up and let it cool completely. Once it’s cooled, fill it and then roll it back up the same way it was rolled originally. This stunning cake is great year-round, but especially around the holiday season! Something about those colors just screams Christmas to me! 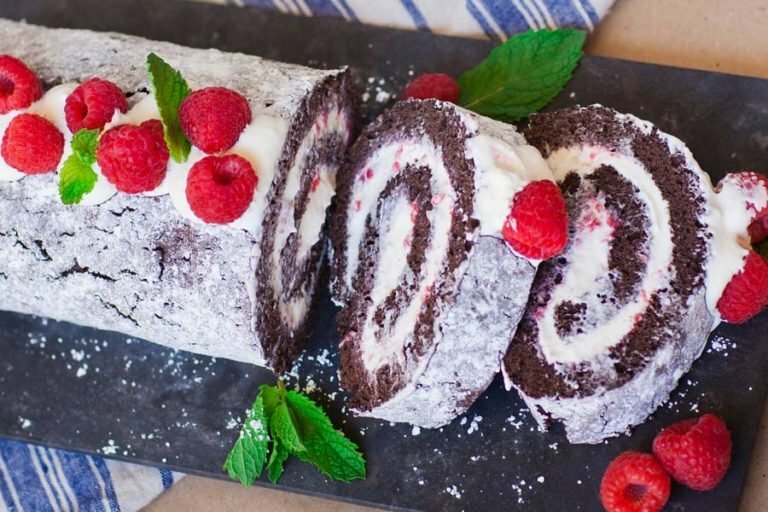 This raspberry swiss roll would be perfect for a holiday party, birthday celebration or for a special dinner! Next up, try my ‘Caramel Raspberry Mousse Cake‘! It’s a heavenly delight! And get the recipe for my favorite whipped cream frosting – I guarantee, you’ll love it! I love these aluminum half-sheet baking pans for sheet cakes. No baker’s kitchen is complete without a classic KitchenAid stand mixer! Use these off-set spatulas for cake decorating and filling. Preheat oven to 350F. Line a 12x17 inch jelly roll pan with parchment paper. Spray sides with baking spray; set aside. Prepare the chocolate sponge cake. Place the eggs, sugar and vanilla into a mixer bowl and whisk on high speed for 5 to 7 minutes, or until eggs are voluminous and white in color. Combine the dry ingredients in a separate bowl: flour, cocoa powder and baking powder. Sift the dry ingredients in small increments into the egg and sugar mixture. Fold gently but thoroughly, combining everything together. Spread the cake batter over the prepared parchment paper. Bake in preheated oven for about 20 minutes, or until top is set. Work quickly with the hot cake: sprinkle the top with confectioner's sugar; this will help prevent your kitchen towel from sticking to the cake. Lay a clean tea towel, kitchen towel or parchment paper over the top, arrange a wire rack or second pan over that and invert the cake. Remove the parchment paper, fold the towel over the edge and gently roll the cake into a log. Set aside to cool completely. Once cake is cooled, prepare the creme filling. Place all of the ingredients into a mixing bowl: heavy cream, sweetened condensed milk, butter, cream cheese and raspberry extract. Mix on medium speed until stiff peaks form. DO NOT OVERMIX! This is important; otherwise, filling will separate. If not assembling cake right away, set the filling into the refrigerator. Prepare the raspberry filling. Simply combine the fresh raspberries with raspberry liqueur and using a fork, crush the berries into a syrup. To assemble the cake, unroll the cake log very gently. Top first with raspberry sauce, then add the creme filling, spreading to the edges. Reserve some filling for the top to use as garnish. Gently roll the cake back into a log, starting from the same end. Garnish the top with reserved filling, fresh raspberries and mint leaves. Place cake roll into the refrigerator to set for a few hours or overnight. can i substitute raspberry liqueur for something else? What if I dont have have either of those? What can I use instead?